Cold fronts often bring heavy thunderstorms, rain, and hail. Cold fronts can produce sharper changes in weather and move up to twice as quickly as warm fronts, since cold air is denser than warm air and rapidly replaces the warm air preceding the boundary. On weather maps, the surface position of the cold front is marked with the symbol of a blue line of triangle-shaped pips pointing in the direction of travel, and it is placed at the leading edge of the cooler air mass. A warm front moves more slowly than the cold front which usually follows because cold air is denser and harder to remove from the Earth's surface. Clouds ahead of the warm front are mostly stratiform, and rainfall gradually increases as the front approaches. Fog can also occur preceding a warm frontal passage. If the warm air mass is unstable, thunderstorms may be embedded among the stratiform clouds ahead of the front. On weather maps, the surface location of a warm front is marked with a red line of semicircles pointing in the direction of travel. A stationary front is a non-moving (or stalled) boundary between two air masses, neither of which is strong enough to replace the other. A wide variety of weather can be found along a stationary front, but usually clouds and prolonged precipitation are found there. Stationary fronts are marked on weather maps with alternating red half-circles and blue spikes pointing in opposite directions, indicating no significant movement. 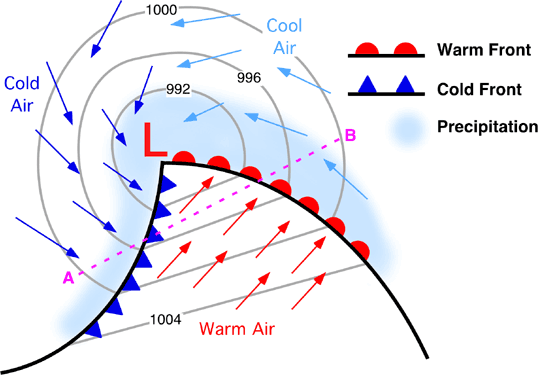 An occluded front is formed when a cold front overtakes a warm front. A wide variety of weather can be found along an occluded front, with thunderstorms possible, but usually their passage is associated with a drying of the air mass. Occluded fronts are indicated on a weather map by a purple line with alternating half-circles and triangles pointing in direction of travel. An outflow boundary, also known as a gust front or arc cloud, is the leading edge of gusty, cooler surface winds from thunderstorm downdrafts; sometimes associated with a shelf cloud or roll cloud. A pressure jump is associated with its passage Outflow boundaries can persist for over 24 hours and travel hundreds of kilometres (miles) from their area of origin. A Trough or outflow boundary are indicated on a weather map by a equal broken orange or black line. A squall line is a line of thunderstorms forming along or ahead of a cold front. It contains heavy precipitation, hail, frequent lightning, strong straight-line winds, and possibly tornadoes and waterspouts. A Squall line are indicated on a weather map by a broken red line with two dots. The dry line may occur anywhere on earth in regions intermediate between desert areas and warm seas. The dry line normally moves eastward during the day and westward at night. The dry line are marked on weather maps with an orange line with scallops facing into the moist sector. Tropical waves, easterly waves, or tropical easterly waves, also known as African easterly waves in the Atlantic region. Tropical wave normally cause areas of cloudiness and thunderstorms. Tropical waves are generally carried westward by the prevailing easterly winds along the tropics and subtropics near the equator. They can lead to the formation of tropical cyclones in the north Atlantic and north-eastern Pacific basins. Precipitations and clouds are associated with the trowal, the projection on the Earth's surface of the tongue of warm air aloft formed during the occlusion process of the depression. The trowal is indicated by a series of blue and red junction lines. A high-pressure area, high or anticyclone is a region where the atmospheric pressure at the surface of the planet is greater than its surrounding environment. The strongest high-pressure areas are associated with cold air masses which push away out of polar regions during the winter when there is less sun to warm neighbouring regions. These Highs change character and weaken once they move further over relatively warmer water bodies. Highs are frequently associated with light winds at the surface and subsidence through the lower portion of the troposphere. In general, subsidence will dry out an air mass by adiabatic, or compressional, heating. Thus, high pressure typically brings clear skies. During the day, since no clouds are present to reflect sunlight, there is more incoming shortwave solar radiation and temperatures rise. At night, the absence of clouds means that outgoing longwave radiation (i.e. heat energy from the surface) is not absorbed, giving cooler diurnal low temperatures in all seasons. When surface winds become light, the subsidence produced directly under a high-pressure system can lead to a buildup of particulates in urban areas under the ridge, leading to widespread haze. If the low level relative humidity rises towards 100 percent overnight, fog can form. A low-pressure area, low, or depression, is a region on the topographic map where the atmospheric pressure is lower than that of surrounding locations. Low-pressure systems form under areas of wind divergence that occur in the upper levels of the troposphere. The formation process of a low-pressure area is known as cyclogenesis. Within the field of meteorology, atmospheric divergence aloft occurs in two areas. 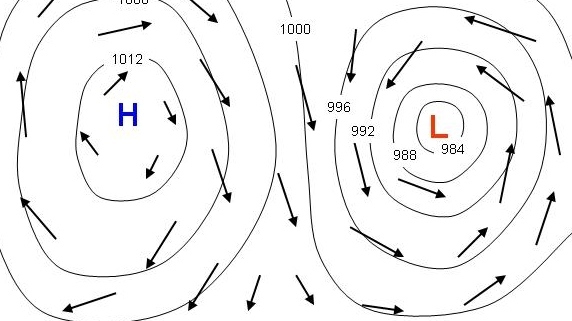 The first area is on the east side of upper troughs, which form half of a Rossby wave within the Westerlies (a trough with large wavelength that extends through the troposphere). A second area of wind divergence aloft occurs ahead of embedded shortwave troughs, which are of smaller wavelength. Diverging winds aloft ahead of these troughs cause atmospheric lift within the troposphere below, which lowers surface pressures as upward motion partially counteracts the force of gravity.